Optical coherence tomography (OCT) [1,2] is an imaging technique which works similar to ultrasound, simply using light waves instead of sound waves. By using the time-delay information contained in the light waves which have been reflected from different depths inside a sample, an OCT system can reconstruct a depth-profile of the sample structure. Three-dimensional images can then be created by scanning the light beam laterally across the sample surface. Whilst the lateral resolution is determined by the spot size of the light beam, the depth (or axial) resolution depends primarily on the optical bandwidth of the light source. 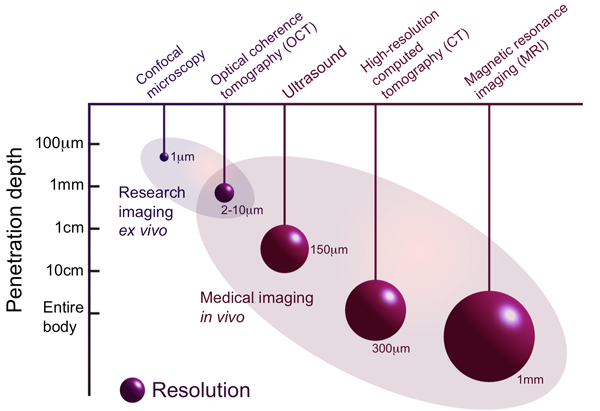 For this reason, OCT systems may combine high axial resolutions with large depths of field, so their primary applications have included in vivo imaging through thick sections of biological systems, particularly in the human body. The technique has already become established as a standard imaging modality for imaging of the eye, with numerous commercial instruments on the market. The application of OCT imaging to other biomedical areas such as endoscopic imaging of gastro-intestinal and cardiovascular systems is currently an active field of research. There are two main categories of OCT instrumentation: Time-Domain OCT (TDOCT) and Spectral-Domain OCT (SDOCT). Time-Domain OCT technology is more intuitive to understand, and most early reasearch and commercial instrumentation was based on this technology. Spectral-Domain OCT is rapidly replacing the Time-Domain technology in most applications because it offers significant advantages in sensitivity and imaging speed. Fig. 1 shows a schematic diagram of the basic fibre-based TDOCT setup. The Michelson interferometer splits the light from the broadband source into two paths, the reference and sample arms. The reference arm is terminated by a mirror which can be scanned in the axial direction; in the sample arm, the light is weakly focused into a sample. The interference signal between the reflected reference wave and the backscattered sample wave is then recorded. The axial optical sectioning ability of the technique is due to the following reason: Because the light is emitted from a broadband source (large range of optical wavelengths), a strong interference signal is only detected when the light from the reference and sample arms has travelled the same optical distance. Specifically, coherent interference is observed only when the optical pathlengths differ by less than the coherence length of the light source, a quantity that is inversely proportional to its optical bandwidth. The act of translating (axially scanning) the reference arm reflector is equivalent to performing optical sectioning of the sample, allowing for the generation of map of optical reflectivity versus depth. Transverse scanning of the sample (to build up a two- or three-dimensional tomographic image) is achieved via rotation of a sample arm galvonometer mirror. Fig. 2 shows the basic fibre-based SDOCT setup. Most of the components are identical to the setup of the Time-Domain technology. The key difference is that in an SDOCT system the reference arm length is fixed. 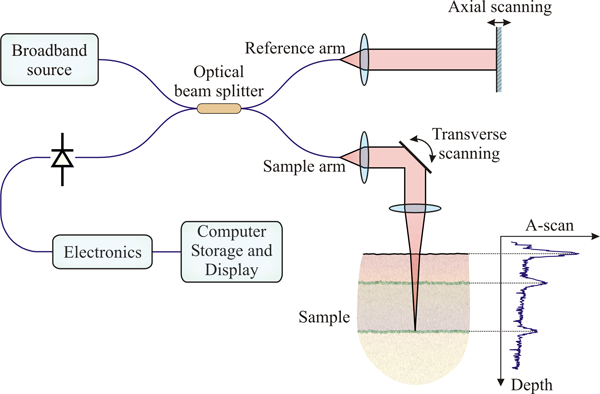 Instead of obtaining the depth information of the sample by scanning the reference arm length, the output light of the interferometer is analyzed with a spectrometer (hence the term Spectral-Domain). It can be shown that the measured spectrum of the interferometer output contains the same information as an axial scan of the reference arm. The map of optical reflectivity versus depth is obtained from the interferometer output spectrum via a Fourier Transform. The particular implementation of SDOCT shown in Fig. 2 is also commonly referred to as Frequency-Domain OCT (FDOCT). 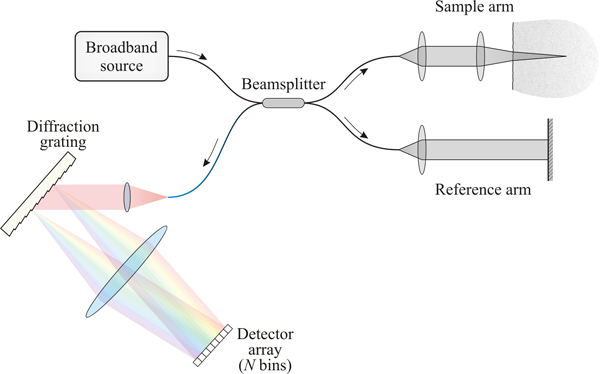 Another variant of SDOCT uses a wavelength-tunable laser to rapidly sweep through a range of wavelengths, allowing the spectrum of the interferometer output to be recorded sequentially using a single detector. This technique is called Swept-Source OCT (SSOCT) and it is particularly interesting for OCT systems operating at wavelengths longer than 1 micrometer, where expensive InGaAs image sensors would be required for FDOCT. OCT may be directly compared with alternative techniques in terms of several different criteria: resolution, imaging depth, acquisition time, complexity, and sample intrusiveness. With regard to the first two, OCT occupies a niche represented in Fig. 3: its imaging depth is typically limited to a few millimetres, less than ultrasound, magnetic resonance imaging (MRI), or X-ray computed tomography (CT), but its resolution is greater. This comparison is reversed with respect to confocal microscopy. Like ultrasound, the acquisition time of OCT is short enough to support tomographic imaging at video rates, making it much more tolerant to subject motion than either CT or MRI. It does not require physical contact with the sample, and may be used in air-filled hollow organs (unlike ultrasound). OCT uses non-ionising radiation at biologically safe levels, allowing for long exposure times, and its level of complexity is closer to ultrasound than to CT or MRI, allowing for the realisation of low-cost portable scanners. The point-scanning nature of OCT technology allows it to be implemented in fibre optics, which makes endoscopic and catheter-based imaging possible. Recent developments in the OCT field  have included the deployment of sources of extremely broad bandwidth, primarily based on supercontinuum generation in various forms of optical fibre, but also employing incandescent sources, to achieve axial resolutions of about 1 micrometer. (Standard current-generation semiconductor sources typically achieve resolutions of about 10 micrometers.) The advantages of polarisation-sensitive imaging are being realised; sample birefringence (dependence of the phase velocity on polarisation) and dichroism (dependence of the amplitude on polarisation) are being exploited as contrast mechanisms. OCT research in OBEL is broad, encompassing theoretical modelling, fundamental-level experimental research, system design and implementation, software development, and clinical measurements. D. D. Sampson, T. R. Hillman, Optical coherence tomography, Lasers and Current Optical Techniques in Biology, G. Palumbo and R. Pratesi, eds. (ESP Comprehensive Series in Photosciences, Cambridge, UK, 2004), pp. 481-571. D. Huang, E. A. Swanson, C. P. Lin, J. S. Schuman, W. G. Stinson, W. Chang, M. R. Hee, T. Flotte, K. Gregory, C. A. Puliafito, and J. G. Fujimoto, Optical coherence tomography, Science, 254, 1178-1181 (1991). D. D. Sampson, Trends and prospects for optical coherence tomography, in 2nd European Workshop on Optical Fiber Sensors, edited by J. M. Lopez-Higuera, B. Culshaw, Proc. of SPIE, Vol. 5502, (SPIE, Bellingham, WA, 2004), pp. 51-58.